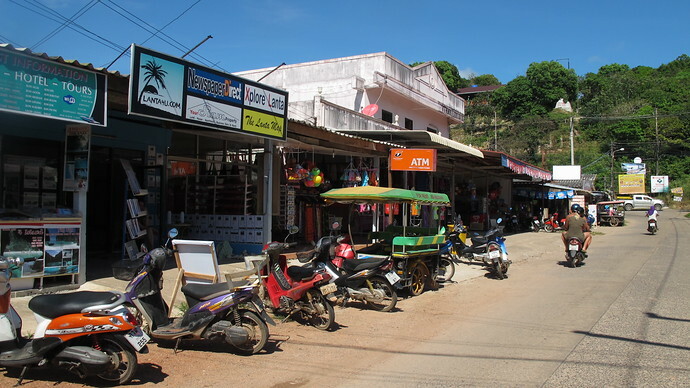 Klong Nin is a small village situated in the middle of Koh Lanta. It’s around 15 km or a half hour drive from the main port village of Saladan. 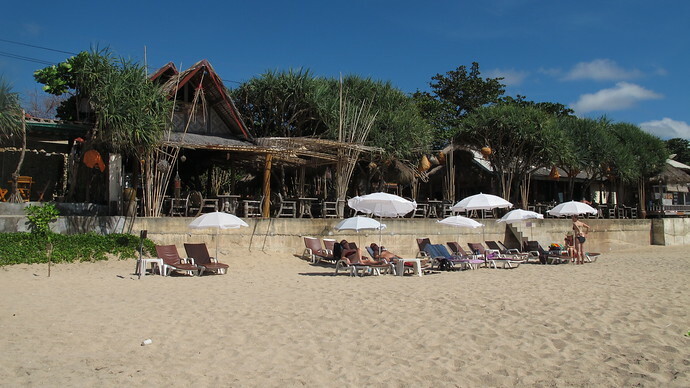 The fine white sandy beach stretches for several kilometers and maintains a tranquil, relaxed, laid back atmosphere. 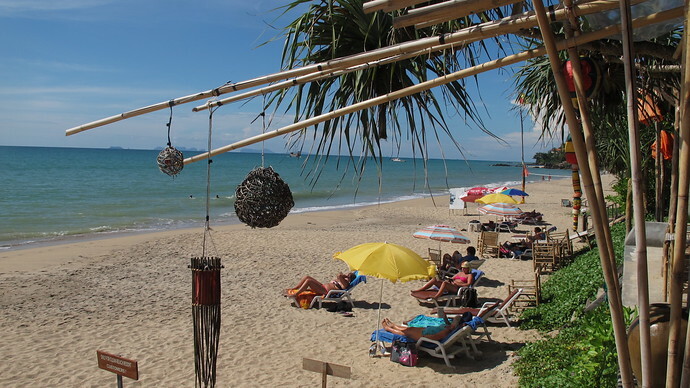 The sea is great for swimming in and all along the beach you will find Koh Lanta’s famous Umbrella Tree (bai toey). With the surrounding mountains and tropical rain forest it makes for some breathtaking scenery. 3 bedroom villa with private pool directly on the beach – it’s only five steps away to the sand! 2 bedroom villa for four people with private pool facing directly onto the beach. The sea is just a couple of steps away. Fantastic pool area surrounded by well-maintained rooms right next to the beach, along with a children’s playground too. A very good restaurant on the road is Cook Kai, the Thai food here is amazing and the chef can make the food to your taste just let them know. Don’t miss outside the Rawi Warin Resort they have Auntie Mae’s Bakery with an amazing selection of cakes, ice cream and coffees. Above this you have a sports bar which has a great roof top terrace and to the right of Auntie Mae’s a nice gift shop. For more recommendations about Klong Nin food, see our Best Klong Nin Restaurants And Places To Eat page. 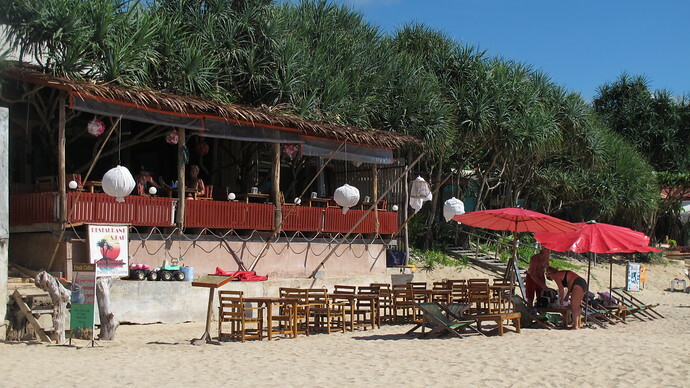 All along the beach you will find numerous beach bars and a variety of restaurants one in particular – Blue Moon Bar – is well worth checking out. 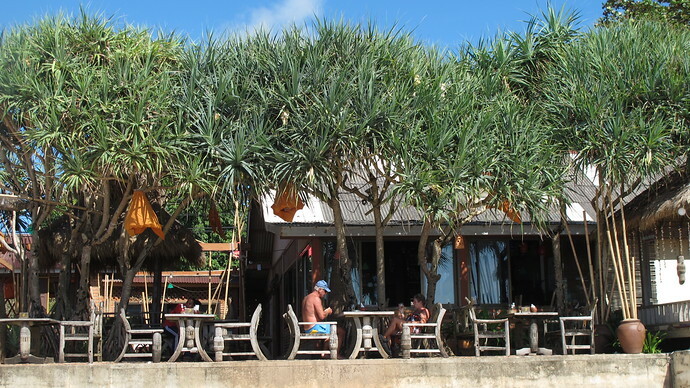 Some of the beach bars are great for watching the amazing sunsets and in a few you don’t have pay for your drinks that day. It is that sort of trustworthy friendliness that makes a holiday really special. If you leave the beach you can walk around Khong Nin’s village. This has many more restaurants to choose from and a lot of ATMs, Pharmacies, Clothes shops, Internet Cafes and Travel Agents. Also you will find a few places selling hand made Jewelery. 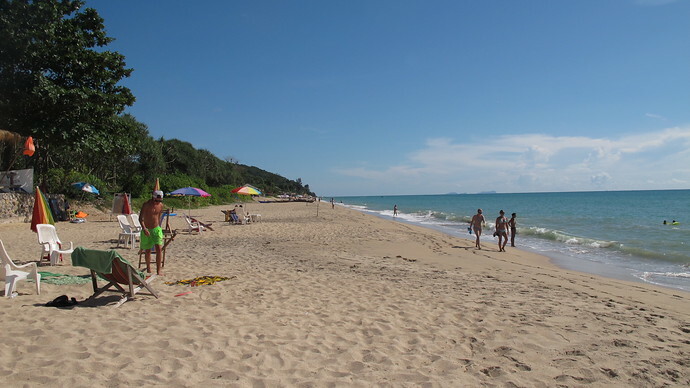 You can see the location of all the major hotels, restaurants and amenities in Klong Nin on our Klong Nin Beach map. Part of the Sri Lanta Resort - a stunning setting with 60 indoor and 40 outdoor seats, and features Thai and International cuisine. 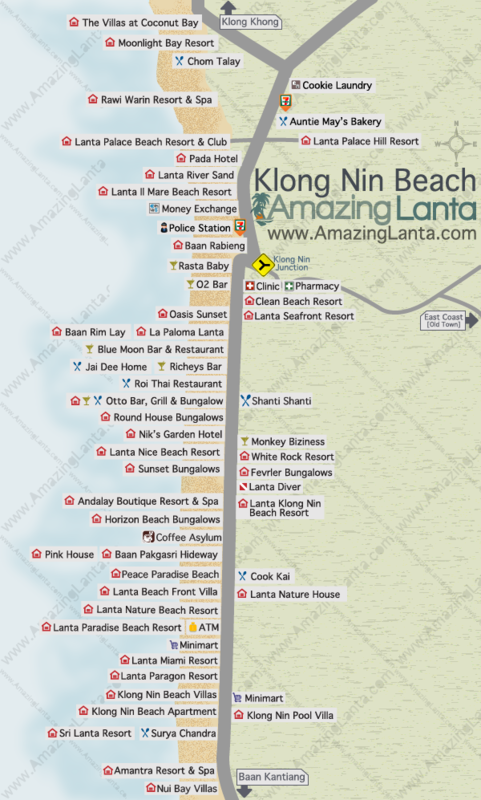 Here is AmazingLanta.com’s interactive map of Klong Nin Beach on Koh Lanta – click on the icons to see information on the hotels. 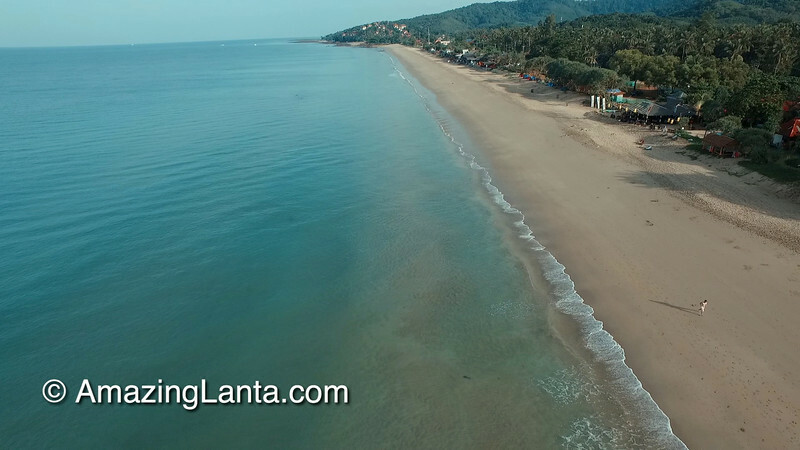 This is a short video of Klong Nin beach on Koh Lanta – absolutely deserted! 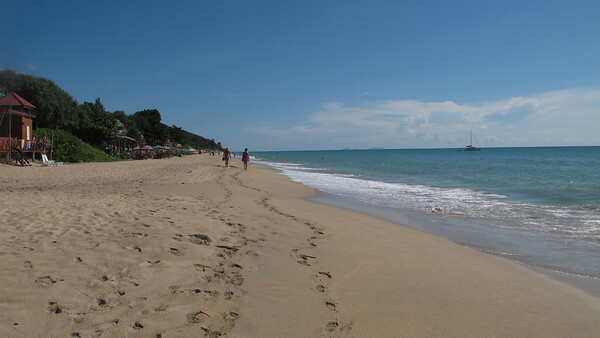 Klong Nin is also the closest beach to Koh Lanta’s Old Town which is found on the East Side of the Island. Here time has stood still and you can find beautiful old teak wood houses and the Sea Gypsy Village. There is also the Hammock House with designer hammocks bought from all over Asia which you can purchase. On the way to Old Town you will see how Thais really live as there is very little development on this side of the island. Also check out Viewpoint Restaurant, a short motorbike ride or tuktuk ride away. The view and scenery here are the best on Koh Lanta.